Today Salesforce introduced the first set of startups to occupy their Incubator space in San Francisco, and we are excited to announce that SpringML is part of that select group. The Salesforce Incubator, located at 650 7th Street in SOMA, is part of the Salesforce for Startups program that was launched in October 2014. The Salesforce Incubator is a place where SaaS companies building on the Salesforce App Cloud can come together to innovate, collaborate, share best practices and interact with others building a business in the ecosystem. 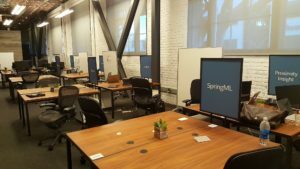 As a startup at the epicenter of the analytics and AI space, it’s clear why SpringML was chosen to be among this group and we couldn’t be more thrilled! We are blessed to be moving quickly on the “startup path” in some respects. We have grown revenue quickly, enjoy dozens of successful customer relationships, expanded our team to 30, and have small offices in Pleasanton, California and Herndon, Virginia. However, we are very much a startup in other ways and depend heavily on the support and interaction of the Salesforce ecosystem. In August, we launched our first predictive analytics application on the AppExchange – Lighthouse for Sales, Wave Edition – and were featured at Salesforce’s Wave Apps for Everyone event and launch. We are now gearing up to launch a new version of our predictive app at Dreamforce next week, and are already hard at work discovering the new ways we can leverage Salesforce Einstein to help our customers move faster, perform better and win. Join us at Dreamforce to find out more about what we’ve got up our sleeve. SpringML and our customers are speaking at seven different sessions throughout the week, and you can find us on the Expo Floor (Booth #2142), at the Genius Bar in the Wave Analytics Lounge @ 111 Minna, or at the Einstein Discovery Center in Moscone West. See you at Dreamforce!